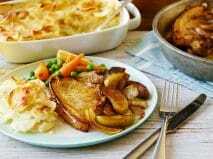 A satisfying supper of succulent pork, rustic veg and delicious, creamy potatoes. The perfect accompaniment to a cosy night in. Preheat the oven to 200°C, 180°C fan, Gas Mark 6. 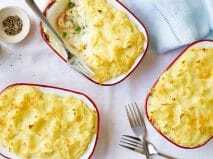 Prepare the Idahoan Dauphinoise Creamy Oven Bake to packet instructions. 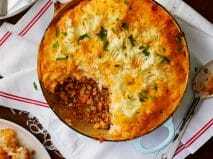 Pour into a 1 litre dish and bake in the oven for 30-35 minutes. Heat 1 tbsp of the oil in a large ovenproof pan and cook the pork chops for 3-4 minutes on each side until golden. Remove and place to one side. Then add the apple and onions and cook for 5 minutes until just softened and golden. Season with salt and pepper then add the pork chops back in and pour in the cider. 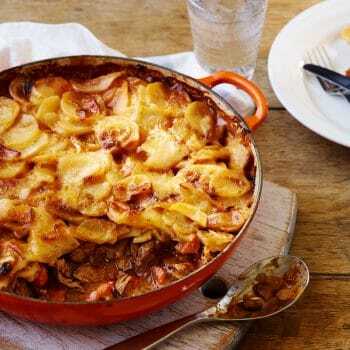 Place in the oven and cook on the shelf beneath the potatoes for 15-20 minutes, or until the pork is cooked through. Meanwhile, cook the vegetables until just tender and serve with the pork and potatoes.